This particular book is actually easier to follow (in audio format) than Feynman's individual lectures. I would, however, warn folks that aren't already somewhat versed in "real" physics (versus the popularized variety) - you may have some difficulty following his mathematical reasonings as he scribbles them on an invisible chalkboard. I had previously studied the 3 volume book set of Feynman's lectures and have many years of physics and mathematical studies so it was no problem visualizing the various equations being scribbled on the chalkboard. I would think this could be a bit frustrating if you haven't previously been visually aquainted with the visual material. That being said, these six lectures aren't exclusively chalkboard math. 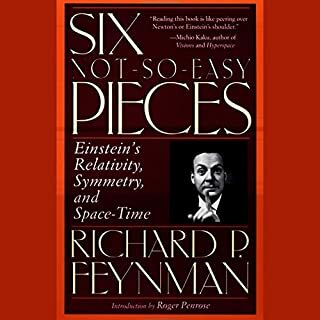 There's a good deal of clever narration and you surely will, if nothing else, get a sense of Feynman's keen wit and wonderful skills as a physics lecturer. I'd give any of Feynman's lectures 5 stars if it wasn't for the fact that you can't see the chalkboard. If you really want to learn physics from Richard Feynman, I'd recommend buying the set of books. The 3 volume, high quality, paperback version can be had for around $70 US and is one of a dozen or so books that I'd probably choose to have along if shipwrecked on the proverbial desert island. Having listened to many non-fiction Audible books, some good, some mediocre, this was my first listening experience that literally captured my imagination. As a result I found it rather difficult to stop listening and attend to my daily chores. I've struggled for many years to understand the mechanics of what brains do with very little success. As Jeff began to lay out his framework my own brain was firing patterns of YES, YES, YES! I began to experience the very rare and pleasant sensations that occur when getting a first glimpse of a puzzle solution. There's nothing like it in the world! This will be the first audible book that I feel compelled to purchase in hard copy. I'm glad I listened first; it's the perfect format for experiencing the marvelous fun in thinking about thinking and the profound joy in gaining understanding about understanding. Of course, I can't guarantee that you'll experience anything similar to what I've described. 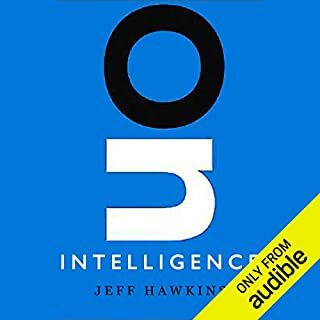 I can guarantee that Jeff will provide you with a fascinating and powerful framework by which some surprising clarity can replace the murky waters of notions like "intelligence", "understanding", and "reality".